Measuring the number of rows in a table – are there any alternatives to COUNT(*)? Today, we will talk about a slightly different, yet very common subject. We will talk about what are the different ways to measure the number of rows in a table. If you have tables with rows greater than the range of INT data type, you may use COUNT_BIG() instead. Microsoft SQL Server comes with a few catalog views, which return information that is used by the SQL Server Database Engine. Obviously, this is one of the places where one should go and look for the row count information. A table with a clustered index will have at least one entry for that index in the catalog view – sys.sysindexes. This entry will have the count of the number of rows in the index, which in-turn is equal to the number of rows in the table (for SQL 2008 and up, a clustered index cannot be filtered and hence clustered indexes will always hold the information for the entire table). Comparing against the conventional options, we find that this option is faster! However, please note that the catalog views may report stale data. Mr. Pinal Dave (blog) provides a great method of accurately determining the number of rows in a table with the use of DMVs in his post here. I would recommend this to be in the "tool-kit” of each and every database developer, administrator and operator. Performance-wise, this method is same as the well-known COUNT(*) or COUNT(1), but it’s interesting because it uses an aggregation function to get the row count. This one again comes from Madhivanan’s post, with a small extension from Books-On-Line. Microsoft SQL Server comes with a big list of system functions (the most common ones being sp_help, sp_executesql and many others which we use on a regular basis). It is no surprise then that we also have a system function to provide information on the number of rows in a table. Rows in a table occupy space, and hence, it is fit that the system stored procedure responsible to predict the space usage is also responsible to predict the number of rows in a table. Here’s the catch: System stored procedures ALWAYS return an INT. If you have rows that exceed the range of an INT in number, do not use these. Also, this is slower in performance when compared to the conventional methods mentioned above. This method performs equally well as the conventional ones. Summarizing, I would attempt to present a small table that would serve as a ready look-up for each of these methods. I hope you find it useful. (*Partial = Fares low on performance for individual tables, but scores high for a group of tables). --which may result in incorrect space usage reports by the sp_spaceused system stored procedure. However, for users using SQL Server 2008 and up, the option to create a filtered index (if the range is pre-defined) and then using the catalog view method is always open. Do you use any other methods? If yes, do let me know – I will publish the alternatives with due credit. Also, if you use any other methods to get the row counts for range of values, please do share your solutions – they will also be published with your name as the contributor. 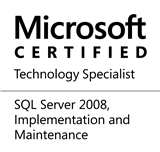 This entry was posted in #SQLServer, Blog, Imported from BeyondRelational and tagged #SQLServer on April 4, 2011 by nakulvachhrajani. 1. Comparing the performance of the conventional methods with the ones using system table is meaningless since the cost for the later will always be the same while the cost of the former one varies based on the number of rows, the index used and the width of the row. 3. When you use select COUNT(*) or a constant like COUNT(1) it gives the optimizer the choice of choosing the narrowest index available. If you specify a column name, the optimizer is forced to use an index on the coulmn if one exists, or the clustered index. The fact of the matter is that almost every application still uses the conventional methods. Ultimately, this leads to performance issues because where we just need an approximate count, the application is trying to be accurate by doing a COUNT(*) or a COUNT(1). As for the COUNT(@@ROWCOUNT) goes, I have seen production code that uses this. Because it was being used by somebody somewhere, it found it’s way on my analysis. Also, for COUNT(*) v/s COUNT(1) v/s COUNT(‘ColumnName’), I have a SQL 7 instance in my test bed, and the difference was seen there – but with SQL 2005 and up I could not see any difference in behaviour. At the end of the day, the point is to choose the right method based on whether performance is more important or accuracy – there’s always a tradeoff and this stands true when you need to fetch the number of rows in a table. Hence the comparison between all the available methods (irrespective of whether they are conventional or not) has been presented. You are most welcome, Javin. Good to know that you enjoyed reading the post. Thanks! My team frequently needs to review the row count on several huge tables and we always use the catalog views. It is true that we do not need the exact number. A difference of a few rows is always acceptable. Reading from catalog views has become our favorite choice because the row count from tables having several billion rows can be fetched in a few milliseconds. Recently I have been struggling with a similar requirement on service broker. We need to frequently monitor the number of rows in `sys.transmission_queue` and the number of rows waiting in one or more service broker queues. A `SELECT COUNT(*)` is not desirable because it may takes several minutes to return when those queues are really huge. I was looking for ways to read this from the system tables and Remus Rusanu helped with the following queries. Thank-you for sharing these queries and experiences, Jacob. I am sure they will be of great help to all who use Service Broker. Hi Nakul…I have doubt on following line .. When we use catalog views to fetch the record counts, you would observe that we looked at the sys.indexes catalog view. What this means is that we are looking at the metadata associated to the table. However, in cases when we perform bulk loads into a table with a very large number of rows (in millions), the statistics might become stale and the indices may not be updated instantaneously. In such cases, fetching row counts via the catalog views would yield the last known results, making them just an approximate count. My recommendation would be to create a temp table, and pump in gigantic amounts of data into it, while noting the row counts as you go. If the confusion still remains, do let me know. This method may be not accurate because it ignore the rows for BusinessEntityID column which having NULL values. In this case COUNT(*) or COUNT(1) gives correct result. Because counts should be generally be taken based on Primary Keys (which can never be NULL), the method is accurate. Yes Nakul, agreed with the example you given. My assumption was for the non-primary key columns used in aggregation. last month actually i had come across loading data into Inventory Historic tables through SSIS package which is having huge number of records. Question is : IS THIS ACCURATE???????? or which one is best way????? As shown above, `sp_spaceused` is neither accurate nor is good from a performance standpoint. If the number of records in the table are higher than the limit of INT, the query would fail. If accuracy is not a major concern, I would recommend the use of catalog views.